Well, it’s hard to believe that it’s been a year since Donald Trump got elected, and at least the good news is that we’re still alive. All kidding aside, the question I’ve been fielding ever since November 8th of last year and to this day is how we are investing around Donald Trump, and the answer has not changed one iota, which is that we are not investing around Trumponomics at all. That often raises eyebrows because we all know that the U.S. stock market indices have continued to hit new record highs almost daily, but I would claim that this has had little to do with the President. Actually, if you had owned the basket of Trump stocks the so-called experts told you to own after last year’s election, you would have woefully lagged behind. And of course, it goes without saying that the top performing sector by a country mile, and I am talking about technology, was the area we were all supposed to avoid since Silicon Valley would pay the price for not supporting The Donald. And yet the tech universe is up 40% for the year and has nearly doubled the rest of the market. There may be some hope out there that we will see tax reform south of the border, but there are an array of other factors influencing investor sentiment right now. Ongoing supportive global liquidity growth and the vast majority of companies beating their profits and sales estimates are among the reasons. That said, excessive valuations and the Fed now coupling its rate hikes with balance sheet reduction I think are going to produce some speed bumps for risk appetite in coming months. Between that and the tapering by the ECB and the fact that the Bank of England joined the Fed on the rate-hiking front, are all very likely going to generate a less calm and more choppy market. Though this actually would be a good thing in terms of opening up some buying opportunities, taking advantage of these opportunities will require having some dry powder on hand. In terms of our highest conviction calls, given that we are coming off the 100th month anniversary of this economic cycle, the third longest ever and almost double what is normal, it is safe to say that we are pretty late in the game. The question is just how late, and we did some research looking at an array of market and macro variables, and concluded that we are about 90% through, which means we are somewhere past the 7th inning stretch in baseball parlance but not yet the bottom of the 9th. The high-conviction message here is that we have entered a phase of the cycle to be very mindful of risk, to be bolstering the quality of the portfolio, to be focusing on strong balance sheets, minimal refinancing risk and companies with high earnings visibility and predictability, and with low correlations to U.S. GDP. In other words, the exact opposite of how to be positioned in the early innings of the cycle where it is perfectly appropriate to be extremely pro-cyclical. So it’s either about investing around late-cycle thematics in North America or it is about heading to other geographies that are closer to mid cycle — and that would include Europe, segments of the Emerging Market space where the fundamentals have really improved, and also primarily in Japan. These markets are not only mid cycle and as such have a longer runway for growth, but also trade relatively inexpensively in a world where value is scarce, and for the most part, still have friendly central banks keeping liquidity conditions flush. I would have to say that if there is a market that has broken out of a 25-year secular downtrend, and where the economic and political tailwinds are significant, it is in Japan. I get told all the time that Japan’s population is declining, but we are buying companies, not bodies, and the bottom line is that even with this declining population, earnings momentum is on the rise and profit margins in Japan are on an impressive expansion phase, and not nearly priced in. In fact, Japan is one of the few markets globally that is not trading at premium multiples relative to its history and is an under-owned market both globally and locally. Turning to Canada, there is some visibility here in the oil price given: the high degree of OPEC compliance and the strong likelihood of an extension to the output cut agreement; the drawdown in US inventories; declines in global storage; solid world demand especially from oil-hungry emerging markets; and a geopolitical risk premium coming back into the market because of the uncertainties now over the Iran deal which sits in Congress and these tensions between Iraq and the Kurds. The shape of the curve doesn’t lie and the recent move from contango to backwardation is an added sign of how tight the crude market has become. The beauty here is that the Canadian E&P stocks are not priced for where oil is today, and over the near term there is more upside potential than downside risk. So they look attractively priced here, once again in a world where inexpensive assets are in short supply. And given the correlations between energy and the Canadian banks, this is good news for this sector as well. It also seems to me that with the Bank of Canada now on hold and with the Fed likely to raise rates, that there are increased odds of the Canadian dollar faltering further. And if it breaks C$1.30 which is the 200-day moving average, then we are talking about the next test being C$1.35 where there is a ton of technical support. And let’s face it, the economy here is going to need another dose of some currency-related stimulus because of the combination of NAFTA uncertainty, the tightened B20 mortgage regulations (which is sure to bite into the housing market next year), and a clouded fiscal picture in terms of the outlook for taxation (I have no clue as to why the Federal government is adding more complexity to this situation, but it is just another reason for the Bank of Canada to stay on the sidelines). In any event, the resultant weakening in the loonie is a positive underpinning for many of our sectors, and again, that includes energy where the Western Canada Select price has surged in local currency terms by just under 20% over the past two months whereas the TSX energy sector has rebounded by 7%. I should add that there are a host of other Canadian companies in our portfolio that have U.S. dollar revenue streams in areas like real estate, banks, insurers and forest products, that are going to benefit from this renewed period of Canadian dollar weakness. You might say it is a match made in heaven. With their taste in gold elevators, the Trump family and the House of Saud were destined to alight at the same penthouse. But the affinity between Donald Trump, US president, and Mohammed bin Salman, Saudi Arabia’s de facto monarch, goes beyond a shared aesthetic for “dictator chic”. It is chiefly transactional. The US-Saudi relationship is the quintessence of Trumpian diplomacy. Its flowering symbolises the decay in the US-led global order. Mr Trump’s approach to foreign relations is a blend of family and money and a weakness for flattery. Japanese prime minister Shinzo Abe pledged $50m to the Ivanka Trump-inspired Women Entrepreneurs Finance Initiative — the World Bank’s effort to seduce America’s first family. Mr Abe, whose first gift to Mr Trump was a gold-plated golf club, hosted Ms Trump in Tokyo shortly before her father turned up. Six months ago, Saudi Arabia and the United Arab Emirates became the first donors to Ms Trump’s scheme with a $100m grant. Now it is China’s turn to host Mr Trump. Its president, Xi Jinping, approved a flurry of Ivanka Trump trademarks shortly before he first met her father in Mar-a-Lago earlier this year. Governments the world over are vying to catch the US first family’s eye. But it is the Saudis who perfected the art. It is no coincidence that Riyadh was Mr Trump’s first foreign destination after becoming president. His motive was obvious. 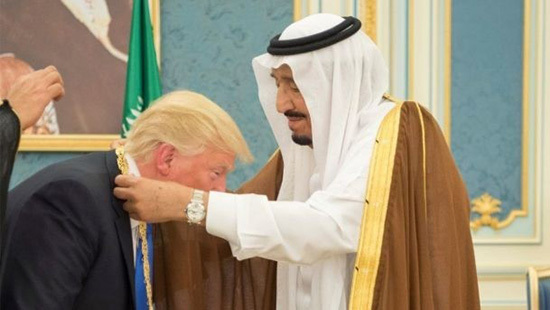 The Saudis had agreed to unveil a $110bn arms contract with the US — exactly what Mr Trump was seeking. The fact that it consisted of letters of intent, most of which had been signed years earlier, was beside the point. Saudi Arabia is unlikely to pay for any of the big items. These include US naval vessels that have yet to be built and an anti-missile defence system the Saudis can no longer afford. Mr Trump’s $110bn triumph was as close as you come to a “fake deal”, says Bruce Riedel, a former senior CIA official on the Middle East. But the Saudis gave Mr Trump what he wanted: an eye-poppingly tweetable shopping list; cash for his daughter’s initiative; a gold carpet welcome; and the mutual goal of erasing Barack Obama’s legacy. Mr Trump is now repaying the Saudis with interest. Last Saturday, Crown Prince Mohammed, known as MbS, launched a power grab that included arrests of other royal notables, at least one of whom was killed in a dubious accident. Mr Trump tweeted that the crown prince and his father “know what they are doing”. The purge followed a visit to Saudi Arabia last month by Jared Kushner, Mr Trump’s son-in-law, who stayed up half the night discussing strategy with the crown prince. Mr Trump is also doing his part to weaken Mr Obama’s Iran nuclear deal, which the Saudis detest. He has also backed the crown prince’s Saudi-led boycott of Qatar, partly because of the city state’s close ties with Tehran. It is unclear if Mr Trump is aware of what he has unleashed — or cares either way. But his support for MbS betrays two principles of US foreign policy. The first is to stoke a religious war. Mr Trump’s America is now firmly on the Sunni side of the regional Sunni-Shia conflict. The Saudi bombing of Yemen, which has claimed thousands of civilian lives, may be a taste of thing to come. Mr Trump’s US is uninterested in Middle Eastern stability. The second is to give succour to pluto-populist strongmen. Few more richly deserve a corruption inquiry than the Saudi royal family. Yet the crown prince’s pretext has no more credence than Mr Xi’s equivalent drive in China — or indeed Mr Trump’s vow to “drain the swamp” in Washington. These are feints to win populist applause while tarnishing rivals. What each shares is a yen to personalise power. Regime labels such as autocracy and democracy offer little guide to their foreign policy. Saudi Arabia, China, Russia, Turkey and others are suffering from leadership cults. It is no surprise they are scratching each other’s backs. The global shock is that America’s leader is among them. Can the chess board return to where it was? That is doubtful. It is worth noting what Mr Trump did on his way to Asia — his most important trip as president. He could have made a clear statement about America’s values and alliances. Instead, he stopped off at the Trump Hotel in Hawaii, which is “tremendously successful”, the White House spokesperson pointed out. It showed a president who cannot tell the difference between the national interest and his family business. It was the kind of self-dealing you would expect from a Saudi royal. But I repeat myself. Since the 2008 financial crisis, Germany has been the de facto leader of the European Union. It has been a voice of calm, urging unity and coordination through the ensuing turbulence, from the financial troubles of Greece, Portugal, Ireland and Spain to the political troubles in the wake of last year’s Brexit vote. Behind the scenes, however, the German Ministry of Defense in February produced “Strategic Perspective 2040,” a federal defense policy document – the first of its kind in Germany since the end of World War II. Some details of the document were leaked recently to the German publication Der Spiegel. The document, and especially the planning scenarios in it, send a message to the world: The structure of Western Europe since World War II, and of all of Europe since 1991, is no more. And Germany intends to look out for itself. Strategic Perspective 2040 considers six scenarios, all relating to the future of the EU and its relationship with the world in general and the United States in particular. The first two scenarios see the EU surviving its ongoing existential crisis. Strong trans-Atlantic relations prevail. This was regarded as the current state of affairs for Germany, where its defense and security focus has been on local and international peacekeeping operations. The third scenario describes heightened tensions on a local level in the Western world. It covers rising nationalism – which is already happening – and an elevated threat of terrorism. The final three scenarios are the bleakest. They detail the further deterioration of the economies of Europe and, ultimately, the collapse of the European Union, coupled with an “increasingly overstrained” United States still serving as the world’s “stabilizing factor.” In the fourth scenario, economic troubles in Europe and in China – Germany’s two main export markets – pose a serious threat to the German economy. Scenario five outlines a bipolar world, where the West consists of the U.S. and Europe – not the EU – and the East consists of Russia and China. Economic competition grows between the two blocs, but while tensions are high, trade prevents major military conflicts. Dependence on fossil fuels and other raw materials drives some Eastern European countries to ally with Russia. The sixth scenario sees a complete collapse of the European Union. The leadership in the United States is no longer able to act decisively to prevent global crises from escalating. The prevailing sentiment from the perspective of the German defense and security establishment is uncertainty. The strategic document notes that Russia’s invasion of Crimea in 2014 was the impetus for its conception. Large chunks of it were written in 2015, before the refugee crisis in Europe, the Brexit vote and the resurgence of nationalism throughout the Continent. Its prescience is commendable; the German military was envisioning some of the problems of today as it watched the EU struggle to find solutions to the problems of days past. Also, the military establishment didn’t build the six scenarios based on the events of 2014. In fact, 2014 was only the tip of the iceberg – Germany has had to deal with strategic questions about its role in European affairs since 2008, when the European Union began to disintegrate, in the process posing a threat to German national interests. For Germany, the European Union needed to be saved for two reasons, both related to its core national interest. It needed the EU to survive for the reasons that have existed since the end of World War II: The EU was a foundation of its relationship with France, a way to ensure that the conflicts of the past stay in the past. But it also needed it for economic reasons. Germany is the third-largest exporter in the world, and most of its exports go to the rest of Europe. The EU free trade zone has been the crux of the German economy. The price of the euro helped German exporters, and Germany’s political power in Brussels, where EU regulations for the common market were formulated, gave Germany other advantages. Protectionism, particularly in Europe, threatens Germany because it diminishes its ability to export. Without strong exports, the performance of Germany’s economy suffers, and social instability isn’t far behind. Beyond economics, regional alliances that could challenge German interests are slowly popping up in Europe. Italy has found it has shared interests with Spain and France, while much of Eastern Europe considers deeper coordination while anxiously watching Russia. As these countries develop stronger ties, Berlin must consider the potential for confrontation with these alliances. This is where the military dimension of the German strategy comes into play. Germany has kept its formal relationship with NATO intact since the end of the Cold War. But without the specter of the Soviet Union, NATO is increasingly more of a political than a military alliance. 2014 was a wakeup call for Germany because it wasn’t prepared for its interests to diverge from those of the Eastern Europeans and even the Americans. Berlin was an early supporter of the demonstrations that installed the pro-Western government in Kiev. Berlin, however, didn’t expect the Russian response. It also didn’t see the U.S. response coming. Germany saw this as a political problem and didn’t want it to turn into a military problem. It also wanted to keep good relations with Russia, with which it has a significant economic relationship. As the situation in Ukraine evolved, Berlin had to deal with a second European crisis concerning refugees. The Eastern Europeans were not bothered by the refugee issue – after all, most of the refugees were headed west anyway – and were concerned only with the Russian advance on their borders. While Germany was trying to keep the EU together, the Eastern Europeans were focused on building up a containment line against Russia – and the U.S. was supporting them. 2008 saw the start of the EU’s process of fragmentation. 2014, in Germany’s eyes, marked the beginning of NATO’s fragmentation. This was Germany’s signal to start planning its own defense strategy. On the bright side for the U.S., which has been urging NATO members to boost their defense spending, Germany’s defense budget will likely grow along with its list of national interests. The release of details about Germany’s first national defense strategy in decades is a signal to the world that it doesn’t intend to set idle. The system that was built after the war no longer works. The EU and NATO are cracking under the weight of an increasingly divergent set of interests among their members. So Germany must make its own plans, and it must plan for the worst. As a candidate, Donald Trump used uncommonly harsh language to criticize Saudi Arabia—the world’s largest oil exporter. He called the Saudi regime the world’s biggest funder of terrorism. Trump also criticized Hillary Clinton for taking Saudi money for the Clinton Foundation. (They were its biggest “donors.”) He even challenged her to return the money. He also famously got into a Twitter spat with a prominent member of the Saudi royal family, Alwaleed bin Talal. As a candidate, Trump blasted the Saudis countless other times. But, after he took office, Trump did a complete 180. He stopped criticizing the Saudis. In fact, he’s now singing their praises. It’s bizarre… as if someone put a severed horse head in his bed. Mere months after criticizing the Saudis, he was on Air Force One headed to Saudi Arabia to do the sword dance with his new friends. It was his first foreign trip as president. Trump’s about face was astounding. 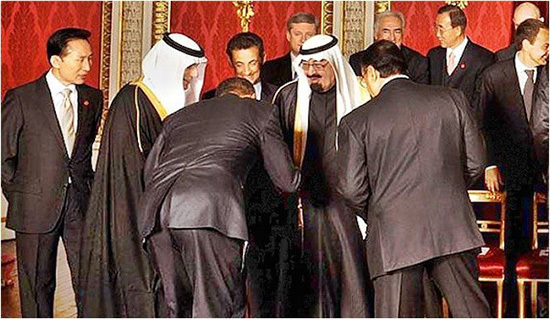 But his newly adopted deference to the Saudis is no different than Obama’s, Baby Bush’s, or any previous president’s. Today, I’ll tell you why Trump made such an abrupt turnaround. I’ll also explain why the Saudis get special treatment from the US Deep State. It’s been rightly said that he who holds the gold makes the rules. After World War 2, the US had the largest gold reserves in the world, by far. Along with winning the war, this let the US reconstruct the global monetary system around the dollar. The new system, created at the Bretton Woods Conference in 1944, tied the currencies of virtually every country in the world to the US dollar through a fixed exchange rate. It also tied the US dollar to gold at a fixed rate of $35 an ounce. The Bretton Woods system made the US dollar the world’s premier reserve currency. It effectively forced other countries to store dollars for international trade, or to exchange with the US government for gold. However, this pseudo gold standard was doomed to fail. Not surprisingly, runaway spending on warfare and welfare caused the US government to print more dollars than it could back with gold at the promised price. By the late 1960s, the number of dollars circulating had drastically increased relative to the amount of gold backing them. This encouraged foreign countries to exchange their dollars for gold, draining the US gold supply. It dropped from 574 million ounces at the end of World War 2 to around 261 million ounces in 1971. To plug the drain, President Nixon “temporarily” suspended the dollar’s convertibility into gold in 1971. This ended the Bretton Woods system and severed the dollar’s last tie to gold. The “temporary” suspension is still in effect today. This is why the Fed can print as much paper money as it pleases. The death of the Bretton Woods system had profound geopolitical consequences. Most critically, it eliminated the main reason foreign countries stored large amounts of US dollars and used the US dollar for international trade. At this point, oil-producing countries began to demand payment in gold instead of rapidly depreciating dollars. It was clear the US would have to create a new monetary system to stabilize to the dollar. So, the US government concocted a new scheme—the petrodollar system. It gave foreign countries another compelling reason to hold and use the dollar. The new arrangement preserved the dollar’s special status as the world’s top reserve currency. For President Nixon and Secretary of State Henry Kissinger, it was a geopolitical and financial masterstroke. From 1972 to 1974, the US government made a series of agreements with Saudi Arabia that created the petrodollar system. The US handpicked Saudi Arabia because of the kingdom’s vast petroleum reserves and its dominant position in OPEC—and because the Saudi royal family was (and is) easily corruptible. 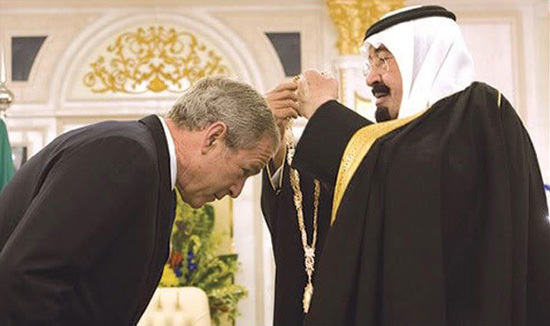 In essence, the petrodollar system was an agreement that the US would guarantee the House of Saud’s survival. 1. Use its dominant position in OPEC to ensure that all oil transactions would only happen in US dollars. 2. Recycle the many billions of US dollars from oil revenue into American weapons manufacturers and infrastructure companies—and critically, into US Treasuries. This let the US issue more debt and finance previously unimaginable budget deficits. By 1977, at least 20% of all Treasuries held abroad were in Saudi hands. 3. Guarantee the price of oil within limits acceptable to the US and prevent another oil embargo. Oil is the largest and most strategic commodity market in the world. 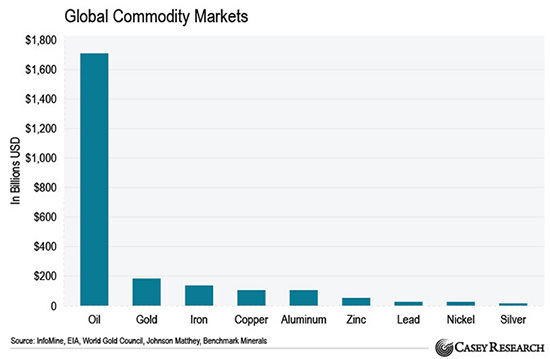 As you can see in the chart below, it dwarfs all other major commodity markets combined. Think about it… If Italy wants to buy oil from Kuwait, it has to purchase US dollars on the foreign exchange market to pay for the oil first. In part, this is what differentiates the US dollar from a purely local currency, like the Mexican peso. Since the oil market is so enormous, it acts as a benchmark for international trade. If foreign countries are already using dollars for oil, it’s just easier to use the dollar for other international trade. This gives the US unmatched geopolitical leverage. The US can sanction or exclude virtually any country from the US dollar-based financial system at the flip of a switch. By extension, it can also cut off any country from the vast majority of international trade. The petrodollar system is why people and businesses everywhere in the world take US dollars. Other countries have had little choice over this. Today, the biggest US exports are dollars and government debt. The US government can create unlimited quantities of both… from nothing. It requires no effort to create US dollars, which can then be exchanged for real things like French wine, Italian cars, electronics from Korea, or Chinese manufactured goods. Ultimately, the petrodollar boosts the US dollar’s purchasing power. It entices foreigners to soak up many of the new currency units the Fed creates. The system helps create a deeper, more liquid market for the dollar and US Treasuries. It also helps the US keep interest rates artificially low. This allows the US government to finance enormous and permanent deficits. Otherwise, this would be impossible without destroying the currency through money printing and inflation. The petrodollar allows the US to finance the world’s largest military, which is bigger than the next seven largest militaries combined. The petrodollar has also allowed the US to spend astronomical amounts of money on welfare and other benefits for over half of its population. It gives Americans a much higher standard of living than they would have otherwise. In short, the petrodollar is the ultimate enabler of big government. The US government could never have become as powerful without it. It’s hard to overstate how much the petrodollar system benefits the US. It’s the bedrock of the US financial system. And it’s the reason the US political elite pamper the Saudis. Bretton Woods lasted 27 years. So far, the petrodollar has lasted over 40 years. I think we’re on the cusp of another paradigm shift in the international financial system. It will be at least as fundamental as the end of Bretton Woods in 1971. Why Doesn't Gold Get The Respect It Deserves? A longstanding curiosity in the investment business has been the disinterest in precious metals among institutional investors. Whether from the handful of consultants now leading the institutional space, or directly from the stewards of our nation’s pension, endowment, and family-office wealth, skepticism over gold’s portfolio relevance remains fairly pervasive. Because investment professionals are generally well informed, competing in an industry in which performance is king, one would assume any asset class deserving of rightful consideration would enjoy a fair hearing. In this report, we present a collection of empirical evidence we view as compelling support of gold’s productive role as a portfolio-diversifying asset. Eight years of zero interest rate policy (ZIRP) have compressed returns across a wide spectrum of institutional investment regimens. Especially in the pension and endowment world, few portfolios are achieving chartered rates of return. In this environment, we find it puzzling that institutional investors still choose to ignore gold’s market-leading returns. As shown in Figure 1, gold has generated positive annual returns in 14 of the past 17 years. What is even more impressive is gold’s performance compared to the S&P 500 Index, the benchmark for broad U.S. equity performance. Gold’s compound annual growth rate (CAGR) for the 16.75 years (2001 to September 30, 2017) stands at 9.68 percent versus 6.01 percent for the S&P 500 Index (dividends reinvested). Indeed, it is fair to say that since the turn of the millennium, any long-term allocation to gold would have improved total returns for the vast majority of pension and endowment portfolios. What is it about gold’s performance that is so difficult to embrace? To us, the most interesting aspect of gold’s dogged performance since the beginning of 2001 has been the wide variety of financial, monetary and asset-market conditions that have prevailed during the various years in which gold has advanced. Along the way, every popular variable to which some portion of consensus attributes strong gold correlation has oscillated repeatedly, yet gold has advanced in the overwhelming majority of these years. Now that the S&P 500 Index has almost quadrupled from its March 6, 2009 low (666.79), few plan sponsors would equate gold’s potential portfolio “alpha” with that available among U.S. equities. However, as shown in Figure 2, the S&P 500, measured in gold terms, remains 64 percent lower today than at its 2000 peak! During the past two corrections in the S&P 500, during which the index declined 50.50 percent (2000-2002) and 57.7 percent (2007-2009), gold provided unrivaled protection of real purchasing power. We are aware of no reasoning to suggest gold’s portfolio-protection benefits will prove any less potent during the next correction in U.S. equities. In fact, the slopes of the lines in Figure 2 suggest gold’s portfolio-insurance value has rarely been more compelling. In documenting an objective record of gold’s portfolio utility, one logically begins with gold’s traditional profile as a safe-haven asset. It goes without saying that gold’s safe-haven reputation accrues from bullion’s established history of relative outperformance during periods of financial stress. As shown in Figure 3, gold has done a masterful job of insulating portfolio capital from sharp declines in U.S. equities during the past three decades of financial crises. As the investment advisory business has become more scientific, amid increasingly frequent financial shocks, the holy grail of portfolio allocation has become the overarching search for non-correlating assets. Methodologies for identifying and measuring non-correlating assets are in no short supply. However, a routine calculation employed by contemporary risk managers is stress testing portfolio components under simulated conditions of both positive and negative economic trends. As shown in Figure 4, gold’s correlation to traditional asset classes remains uniquely low during periods of both economic expansion and contraction. In other words, gold’s portfolio-diversification benefits are not solely dependent on bad news. Institutional focus on non-correlating assets has directed trillions of dollars of investment capital towards hedge funds and specialized investment partnerships in disciplines such as real estate, private equity and venture capital. A more recent trend, however, has been mounting investor backlash against elevated fees charged by alternative managers in the context of mediocre investment returns (not to mention onerous liquidity and lockup provisions). In short, a marquee consideration for today’s pension and endowment stewards has become whether the added fees of alternative investments are truly worth it. Recognizing there will always be outlying homeruns in the ultra-competitive partnership space, it is instructive to compare the performance of gold bullion directly against the performance of prominent indices of alternative-investment vehicles. As documented in Figure 5, gold bullion has more than held its own against returns of high-profile alternative investment indices, both during the recent past (year-to-date 2017), as well as over the long run (2000-2016). Even more challenging to industry status quo, gold bullion has rivaled the performance of alternative asset indices while simultaneously displaying far lower correlation to these vehicles than either stocks or bonds. As shown in Figure 6, the correlation between prominent alternative asset indices and the S&P 500 Index has averaged 81 percent over the decade through September 30, 2017. By way of comparison, the 10-year correlation between these same indices and spot gold has averaged just 10 percent. At an 81 percent correlation rate with U.S. equities, are high-priced and unwieldy alternative vehicles worth their freight? What are we missing? Now a highly operative question might be, “Is there a reliable method for investors and institutions to right-size a portfolio commitment to gold?” Given the variables involved, there can never be a single, definitive solution to any portfolio-construction challenge. For a quick answer on the fly, we offer that a 2–10 percent allocation can make sense in most portfolios. But let’s dig deep and get a more technical answer. Historically, asset allocators have favored classical “mean variance optimization” techniques to quantify appropriate portfolio weightings among selected “input” assets to maximize projected portfolio returns within predetermined ranges of risk tolerance. The shortcoming of mean-variance calculations is that they massage historical price trends to calculate (a geometric average and standard deviation for) a likely efficient frontier between future returns and future volatility. Tapping into the contemporary investment trend of sophisticated quantitative analysis, we cite the considered work of Richard and Robert Michaud (New Frontier Advisors) in developing their “resampled efficiency optimization” approach to portfolio allocation. While resampled efficiency (RE) optimization still recognizes there is some information about future returns and covariance in historical performance, the method of portfolio optimization assumes there are no “fixed known parameters,” and that there will always be a degree of variability in future outcomes. The essence of RE optimization is to establish a portfolio allocation most likely to maximize returns for every unit of undertaken portfolio risk (the “information ratio”) amid any combination of future financial and market conditions. In Figure 7, we present RE optimization outcomes for five different portfolios of traditional assets, each with unique risk tolerance assumptions. For example, the most conservative portfolio mandates a 20 percent weighting in stocks (and other assets) versus an 80 percent weighting for cash and bonds. The most aggressive portfolio mandates an 80 percent weighting in stocks versus a 20 percent weighting for cash and bonds. The five asset inputs utilized in this exercise are cash, stocks, bonds, commodities/REITs, and gold. RE optimization suggests a gold allocation between 2 percent and 9 percent will maximize risk-adjusted returns across the spectrum of risk tolerances. Broadly speaking, the higher the risk in the portfolio, whether in terms of volatility, illiquidity or concentration, the larger will be the modeled gold allocation to offset that risk. It is one thing to establish that an allocation to gold can augment risk-adjusted returns among basic portfolio building blocks such as stocks and bonds. In the contemporary institutional world, however, so much brainpower and so many resources are directed at synthesizing complex investment strategies, it is difficult for participants to recognize that gold’s passive and seemingly anachronistic profile adds considerable value to modern portfolio dynamics. For example, despite the fact that institutions are laser-focused on non-correlating assets, we believe industry due diligence generally gravitates to alternative vehicles with the highest nominal returns in each product category. In the process, gold’s unrivaled powers of non-correlation are shortchanged. It is gold’s lack of correlation to all other portfolio assets, as opposed strictly to bullion’s nominal return patterns, which empowers gold’s unique ability to protect against portfolio drawdowns. As we have long maintained, when paper assets perform as advertised, gold’s portfolio utility recedes to average profile. However, when paper ceases to perform as advertised, such as during stress tests like 2008, no alternative asset can match gold’s non-correlating, portfolio-protection power. 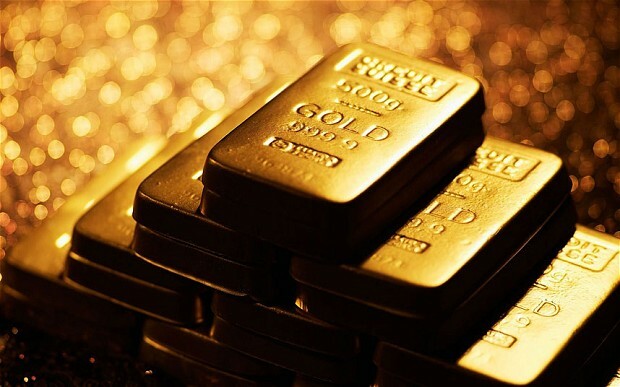 On the other hand, to many investors, gold offers attractive protection from financial assets when their quoted prices are perceived as detached from intrinsic value, or, even more importantly, when the integrity of the unit of account in which these prices are quoted (fiat currencies) becomes increasingly suspect. By way of example, some of the world’s most sophisticated investors, including Soros, Druckenmiller, Klarman and Singer, employ gold liberally to navigate fluid market conditions. To these heavyweight investors, gold offers the ability to remove, at a moment’s notice, virtually unlimited amounts of portfolio capital from the vagaries of overpriced markets or questionable central bank policies. In our experience, the logic of a portfolio allocation to gold is most easily understood by owners of accumulated wealth. Those who have created significant capital are highly sensitive to potential risks of its dissipation, even amid the intoxication of fresh weekly highs for the S&P 500. Somewhere in the middle rest gold’s true investment merits. In this report, we have presented evidence that a portfolio allocation to gold can improve risk-adjusted returns in portfolios of any risk tolerance. Gold’s long-term returns have rivaled the performance of sophisticated alternative-asset indices, with far lower correlations to traditional asset classes, and without burdensome fee and liquidity frictions. The empirical data suggest a modest gold allocation provides tangible portfolio diversification benefits in any investment climate. Given the unprecedented monetary, financial and asset-valuation risks now confronting investors, gold’s potent benefit of purchasing-power protection, which essentially accrues for free, seems to us an incredibly precious commodity.